This 4-story apartment building features a central courtyard with water fountain, grills, and comfortable patio seating. The building opened for occupancy in the fall of 2011 and houses 163 students. Located on University Drive, the complex is conveniently close to the campus and is situated directly across from Mayborn Campus Center. The building was named in honor of Mrs. Martha White Farris, a member of the Class of 1942 and loyal supporter of UMHB. Farris Hall offers a mix of 2-bedroom, 3-bedroom, and 4-bedroom configurations. Each unit has a shared living room, kitchen, dining room, and laundry area, plus a private bedroom and bath for each resident. Each of the apartments offers WI-FI, cable TV, and data ports both in the living room and in each bedroom. Each unit is fully equipped with a washer and dryer, an electric range, a microwave, a refrigerator, a garbage disposal, and a dishwasher. 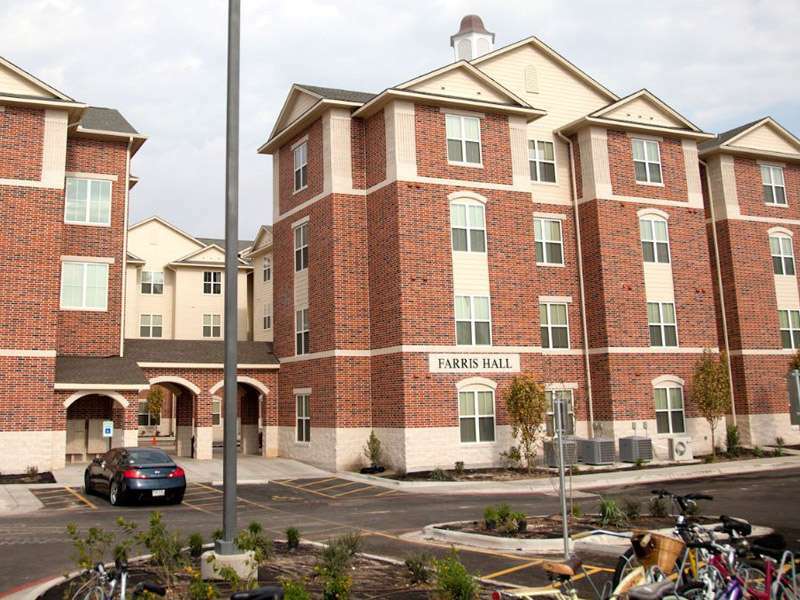 Farris Hall uses a keyless entry system which allows students who live there to use their student identification cards to enter their apartments. The building also has common use areas on each floor, with a great room on the first floor that is equipped with a ping pong table, pool table, and large flat screen TV. There is a meeting room, computer lab, and media room on the remaining three floors. The living room is an open concept style with the kitchen and dining area sharing the same space. This space is 168 sq. ft. in size and also features a kitchen island for food prep and seating. There are large picture windows in each living room.